Experience the perfect blend of natural beauty, cultural traditions and sophisticated attractions all wrapped up in a tropical island paradise. Hawaii can be whatever you want it to be. On the one hand it's a natural tropical paradise with lush rainforests, idyllic beaches and a Polynesian culture that's famous for hospitality. On the other, it's a thoroughly modern destination for shopping, dining out, bar-hopping and nightlife. Part of the attraction lies in how easy it is to be chilled out one moment and living it large the next. To help you make the most of your holiday, here's our pick of top things to do in Oahu Hawaii. Pause, reflect and remember at the site of the 1941 attack on Pearl Harbour, which led to the USA entering World War II. The naval base has largely been preserved just as it was on that fateful day. See mementoes and exhibitions, then boat to the memorial built over the sunken battleship USS Arizona. A visit to Pearl Harbour is widely recognised as one of the best things to do in Hawaii. 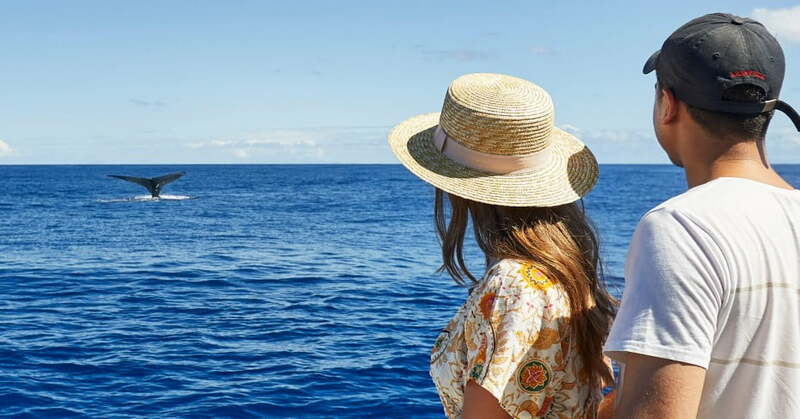 Oahu's warm, clear waters are some of the best places to see whales, swim with wild dolphins and sea-turtles, or snorkel among and brightly coloured reef fish. Many companies promote eco-friendly tours, taking you close to the action while protecting wildlife and the ocean. Surfing was born here, so there's no better place to learn, improve your skills or watch some of the world's best surfers. To see the best breaks and riders, head to the North Shore. As well as surf beaches, Oahu has plenty of safe, sandy bays where you can hire a paddleboard or kayak – or simply jump around and make your own waves. Drag yourself off the beach, because Oahu's shopping is rated by many visitors as one of their top things to do in Hawaii. Waikiki's Luxury Row features designer boutiques like Hugo Boss, Miu Miu, Tiffany and Gucci. Nearby is Ala Moana, the world's largest outdoor mall with 310 stores on palm and pool-lined boulevards. Bargain-hunters should head to Waikele's outlet stores and at Haleiwa village you'll discover a bohemian, arty vibe. What's good here? Everything. Oahu's food is a melting-pot of the island's cultural heritage. Lau lau is a traditional foodie experience: pork and butterfish wrapped in leaves and steamed for hours. Food trucks serve street food to kill for: tacos, burritos and shrimp sandwiches on the sand. Quench your thirst with sweet, sticky shave ice. If you're a pineapple fan, the Dole pineapple plantation tour is a longstanding Hawaii tourist attraction. An hour's drive from Honolulu's buzz, the North Shore retains the feel of old-time Oahu - small villages, laidback lifestyle, bush walks and mile-upon-mile of golden-sand beaches. It's a hub for free things to do in Hawaii with family. Surfers say if the perfect wave exists, you'll find it here. Browse the tiny shops to discover locally crafted surfboards, clothing, jewellery and one-of-a-kind treasures. The North Shore is also home to Turtle Bay, known for its large ocean-front resort and spectacular helicopter tours. They filmed Jurassic Park, Pearl Harbour, Magnum PI and LOST at Kualoa Ranch, but it's much more than a movie set. The 1,620 hectare working cattle ranch and private reserve is a paradise for outdoor activities like horse riding, all-terrain vehicles, e-bikes, zip-lining and tramping. For a special experience, you can check out Secret Island or board a catamaran and head out on the bay for offshore views of the mountains. The true scale of Oahu's dramatic volcanic landscape - with its sheer cliffs, deep valleys, hidden beaches and stunning waterfalls - is hard to appreciate while on land. Charter a chopper or climb into a small plane to soar over world-famous surf breaks, the 300 metre Ali'i Sacred Falls, lush tropical valleys or historic Pearl Harbour. Downtown Honolulu has the only royal residence on USA soil. At Iolani Palace, home of Hawaii's last monarchs, you can explore the grand halls, throne room and dining room – even the 'imprisonment room' of luckless Queen Liliuokalani. After a hard day on the beach, head to one of Waikiki's beachside bars and order a mai tai made with Oahu rum. Duke's Barefoot Bar, House Without a Key and the Mai Tai Bar (look out for Ellen) are legendary. Sway to the band's steel guitars and watch the sun sink into the sea before exploring the fun things to do in Hawaii at night.